You can spend hours - if not days inside the edit, eyes focused on your bright monitor, so it's important you choose the best tools to help you become more productive than ever before. 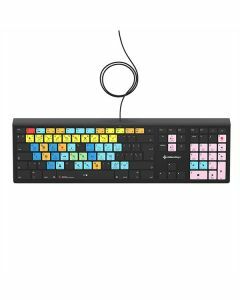 few months back Editors Keys had a dream of creating the most advanced editing keyboard for Steinberg Cubase, so they put their heads together and worked with thousands of audio producers just like you from around the world, to come up with the ultimate backlit editing keyboard. Now for the first time you can edit faster, reduce eye strain with the world's first and only backlit editing keyboard for Steinberg Cubase. Say hello to the world's first backlit editing keyboard for Steinberg Cubase. From ColdPlay’s producer Rik Simpson, the BBC, Fox Network to thousands of home users, the campaign was backed from users from all over the world. The successful Kickstarter campaign reached over a huge 200% funding goal. That's why they've developed the brand new range of backlit keyboards, all designed for your editing software. How many times have you sat in a dark room editing, struggling to see the keyboard, or simply used a poor quality keyboard? They're getting rid of both of those problems today. Eye strain is a big problem for most computer users and for editors working in a dimly lit room the problem can be much greater. Did you know you can be causing yourself to suffer with eye strain, back pain and neck pain? Editors Keys worked with Optical Express in the UK to ensure they developed a product which would help remove these problems. “This innovation should significantly reduce eye strain symptoms. This will ultimately improve efficiency for the user & improve eye health in the long term” said Stephen Hannan, Clinical Services Director of Optical Express. The keyboards are designed to help you edit faster than ever before. No more looking through PDF's to find the shortcuts for Steinberg Cubase. Now you'll have them to hand. You'll be surprised how quickly you can edit. Editors Keys are used by most of the worlds top editing suites, post production houses, recording studios and universities, so it's time for you to improve your computer set up and join the editing revolution.